« What is in store for Assyrians in 2015? they confiscated close to 2000 books-leaving behind only Islamic books-and taking them away. What happened next is very disturbing but not shocking at all: ISIS set the books on fire, destroying them all in the process. Sounds familiar? yes it does, it is similar to what the Mongols did in Baghdad in 1258 when they threw thousands of historical books, documents and records-many of which were Assyrian by authorship and origin-into the river, purportedly turning the river black from all the spilled ink. But it is not just the Mongols and ISIS. Iraq has always been an interesting place: lots of history but at the same time rarely ever stable enough to sustain this rich history. 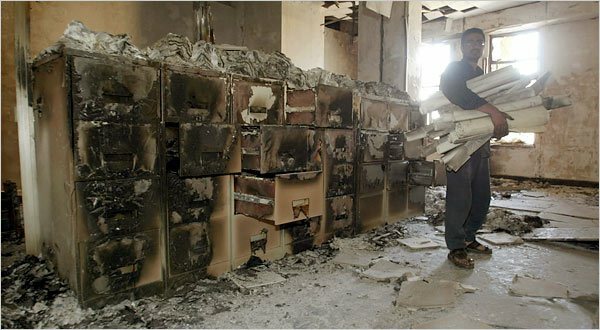 From ancient times and until now, it has never been stable enough for more than a few years or decades at a time and that has meant that its historical treasures-especially books and artifacts-have always been the subject of looting, burning and total destruction. Iraq may have an vast collection of historical and ancient books and artifact today but it should have been double this had it not been for all the wars and destruction that this land has seen over the ages. While artifacts and other physical objects can’t be easily digitized, other than simply taking pictures of them, books can have a better fate and be protected from destruction. Thanks to the internet and other new technologies that didn’t exist even a few decades ago, Iraq can and should start to digitize as many of its ancient books and archive records as possible. Google Books for example is already the largest digital depositary of books in the world. Using new scanning technology that Google pioneered, you can now find English-other languages are slowly being added too-books that go as far back as 500 years ago, which is shortly after the printing press was invented. This ensures that these priceless documents and books are preserved virtually forever, eliminating the possibility of a future destruction through fire or intentional sabotage which unfortunately is an inevitable possibility in a place like Iraq and the Middle East in general. Imagine for a second if Google Books or other similar technologies existed some 1000 years ago. It would completely change our world today. 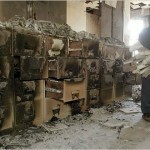 It would mean that the books were preserved already, even if the Moguls tried to destroy them when they invaded Baghdad. From a historical point of view, this would be a complete paradigm shift from what we have today. It would mean having access to material that we can’t even dream of today. For example, from an Assyrian prospective, it would shed new light on what happened to Assyrians after the fall of their empire and how they evolved to become Christians and continue their legacy. While we do have some information on what happened to Assyrians after the fall of their empire, a lot has been lost in the centuries following the fall of their empire. The ruthless moguls ensured that most of what was left, would be lost forever in the Tigris river in Baghdad. From a Christian prospective, we would likely have a lot more literature and volume on how Christianity came to Iraq and neighboring regions etc. Google, in fact, has already taken steps to digitize physical objects from the past. Using Google Maps technology, they have already digitized the ‘National Museum of Iraq‘ , allowing you to take a virtual tour inside. Not a substitute for the real thing of course, but at least we have a copy in case the real thing is lost as a result of fire, looting or direct sabotage by terrorists, looters etc. Digitization, of course, has its limitation. For one, it may preserve the text of the book and even the way its cover and its pages look, but it is not a substitute for the real book and the way it feels when you touch it. But at the end of the day, it is better to at least preserve the content of these books than not to have anything left at all. In other words, when we can’t preserve both the substance and the form, let us at least save the former. After all, the ideas we inherit from these books are what matters the most. The preservation of the book itself, the cover, the pages, while of paramount importance, comes only second to preserving the actual idea, facts and information that these books and records try to convey to their readers. Interesting, similarly I’ve red a book by D. Eagleman ‘why the net matters’ and he also mentioned something about digitizing ancient books and reports. Nice article. Wish you had a louder voice.